There’s something deeply unsettling about the school of Saint Eusebius Abbey. Fanatical monks run the school with the power of the birch rod and it isn’t just reserved for unruly pupils. A train arrives at the nearby village of Horkinge and a small boy disembarks clutching a teddy and wondering what his new school has in store. The other pupils have already worried him with stories of brutal beatings but it can’t be that bad, can it? A few hours later another train arrives and a young man called Charles Upton steps off and catches a taxi to the school. 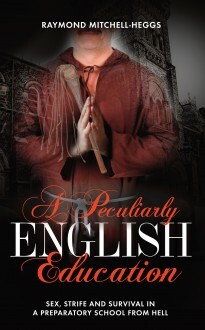 After finishing his war service and hoping to escape from a confused sexual past, Charles signed up to become a schoolmaster at Saint Eusebius Abbey but will soon discover a school rife with oppression and corruption. The horrors of the brutal regime of Saint Eusebius Abbey becomes apparent to both as the story unfolds into one of plots and plans in a dangerously-thrilling tale of prep school wickedness. A Peculiarly English Education is graphic, gripping and full of dark happenings that have even darker explanations.